When you first begin your search for a used full-size pickup truck, you probably have a pretty good idea of the make and model you want to get. There’s a good chance that you’ve been eyeing a certain vehicle type for a while, maybe even years. That means you have a lot of information stored somewhere in your brain, but pouring through it might be tough. Deciding on which model year to narrow your search down to can be difficult without having it written down. That’s why we’ve done it for you! If you’ve decided on a used GMC Sierra for sale but need a little extra info on the differences between the year models, keep reading! In 2014, the GMC Sierra underwent a full redesign. We’re going to focus our research on model years 2014 to 2018 to give you a full picture of this redesigned truck. Used GMC Sierras are popular pickup trucks that you probably see on a regular basis, but on the surface they look pretty similar. Used GMC Sierras are tough, sturdy, and have excellent safety scores. Understanding what’s on the inside is hugely important before you make your final decision. These used GMC Sierras exemplify some of the advances in technology the industry has experienced even in a few short years. You’ll see only minor changes between each, but some may be a make-or-break feature in your decision-making process. You’ll find new driver assist features, in-cabin tech, and increased towing capabilities. However, most of the main changes occurred between the 2013 and 2014 models years when the GMC Sierra underwent a complete redesign. When deciding between used GMC Sierras, you should heavily factor mileage, vehicle history, and condition into your decision process as there aren’t hugely significant differences between model years. In 2014, the GMC Sierra was completely redesigned and began the GMC Sierra’s third generation which is still current. Everything from the exterior to the engines was upgraded. This was a strategic move by GMC to offer customers one of the highest rated full-size pickup trucks on the market, and used GMC Sierras staying power is a testament to their success. Additionally, the National Highway Traffic Safety Administration awarded the 2014 Sierra five out of five stars overall, another reason that you still see so many 2014 Sierras on the road today. The 2014 model of the GMC Sierra comes in a choice of either 3 seats with a 3-person seat configuration in the Regular Cab or 6 seats with either the Crew Cab or Double Cab. This means that you can accommodate the whole family or save a bit on gas if you don’t need the extra passenger room. These styles and can configurations carry through the 2018 model year of the redesigned GMC Sierra. The 2014 GMC Sierra saw some new and more powerful engines which have remained constant ever since, having widely satisfied the needs of GMC Sierra owners nationwide. The base engine of a used GMC Sierra from model year 2014 is a 285-horsepower V6. Other used Sierras that you find may have an upgraded V8 engine equipped. These are either a 5.3-liter V8 or a 6.2-liter V8, offering 355 and 420 horsepower, respectively. When the 2014 GMC Sierra was new, buyers also had a choice of either RWD or 4WD drivetrain. Depending on the engine, drivetrain, and cab configuration of the used GMC Sierra for sale, you can expect to get between 14–18 miles per gallon in the city and between 20-24 miles per gallon on the highway. There are also four distinct trims of the 2014 GMC Sierra which have remained consistent through the years following. These trims are the base Sierra, SLE, SLT, and Denali, with Denali as the highest and most luxurious trim level. These different configurations make determining price a headache for used car buyers trying to get a great price. At McCluskey Auto, we’ll walk you through all the features and customizations of the used GMC Sierra you’re viewing and offer you a fair market price. You can remain confident in your choice to buy from McCluskey Auto and know that we have the expertise to evaluate any used GMC Sierra correctly. The 2015 model year of the GMC Sierra saw only a few minor changes following the complete redesign of the truck in 2014. The main differences between the 2014 version and the 2015 version are in the Sierra's technology. Used 2015 GMC Sierras have Siri Eyes Free and an available 4G LTE hot spot for people that want to stay connected while on the road. The other main change that happened between the 2014 and 2015 model years was the addition of an adaptive suspension with the Denali trim. The GMC Sierra’s adaptive suspension (Magnetic Ride Control) monitors road conditions to delivers a smoother ride. Something to consider when looking to buy a used GMC Sierra. TLast but not least, there is an extremely small increase in fuel efficiency for the 2015 model years. You can expect to get ever so slightly better gas mileage, 15 - 18 MPG in the city and 21 - 24 MPG on the highway. This is only one MPG better on certain configurations and the fuel efficiency reverts to 14 – 18 miles per gallon in the city and between 20 - 24 miles per gallon on the highway for all subsequent years. Like the 2014 version, 2015 Sierra earned a five-star overall crash test rating from the National Highway Traffic Safety Administration (NHTSA). TLike the 2015 GMC Sierra, there were only a few moderate changes made to the 2016 version of the GMC Sierra. The gas mileage reverted back to the 2014’s fuel efficiency, having bumped up a single MPG in the 2015 version. The 2016 GMC Sierra receives an EPA-estimated 14 – 18 miles per gallon in the city and between 20 - 24 miles per gallon on the highway. TThe main change to the 2016 GMC Sierra is in the infotainment system, a technology that was still “coming into its own” during this year. Apple CarPlay and Android Auto were added as enhancements to this used GMC Sierra’s infotainment system. These third-party apps integrate with the truck’s infotainment system to allow drivers and passengers to control music, navigate, and communicate with voice commands, all with their phone’s interface. Many drivers have become accustomed to this level of convenience in their trucks. If you’re one of these people, definitely take the inclusion of Apple CarPlay and Android Auto into your decision when choosing a model year. More technology features were added to the 2017 GMC Sierra, with the automaker adding some more driver assistance features. The 2017 GMC Sierra also became more powerful and capable, something heavy duty workers should think about before deciding on a used GMC Sierra model year. For 2017, the GMC Sierra got a higher maximum towing capacity so that even the most hard-working people can get the job done with their Sierra. Now, it can tow up to 12,500 pounds when properly equipped. Many people don’t find it necessary to be able to tow this much, so find out the towing capacity of the Sierra in question before you commit. Not a whole lot changed between model years 2017 and 2018 for the GMC Sierra. 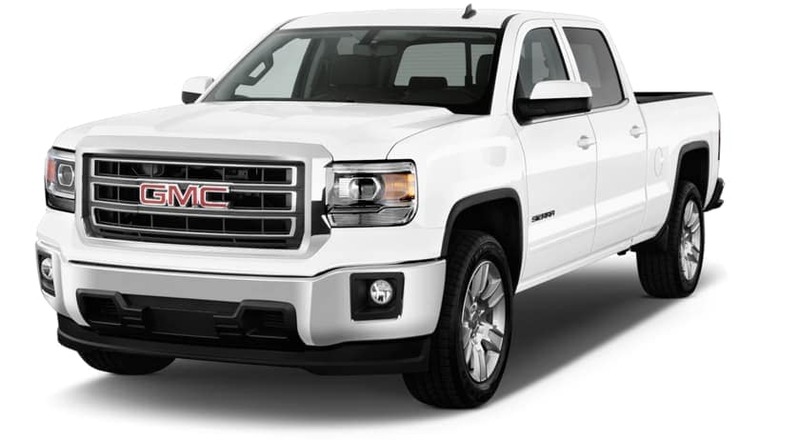 The main benefit of buying a newer used model of the GMC Sierra is that the truck is likely to have fewer miles on it. There’s also a good chance that you can get a used GMC Sierra for sale as a certified pre-owned vehicle. For 2018, the only changes came in the form of a standard rear-view camera and a 7-inch touch screen, which is larger than previous versions. These features improve the convenience and of the used GMC Sierra and should be factored into any decision-making. Overall, you can’t really go wrong with any model year of the GMC Sierra. It has an outstanding safety rating and a history of toughness and strength. Depending on how highly you value new and improved technological advancements should factor heavily into your final decision. Here at McCluskey Automotive, we understand the importance of finding exactly the right vehicle to meet your individual needs. Buying a new or used truck is a very personal experience and a decision that will impact your daily life for years to come. That’s why we pride ourselves on our ability to help you find the perfect vehicle. Our friendly and professional staff are well equipped to listen to your needs and desires and recommend a vehicle to you without trying to get you to go over your budget. We’ve put together used model pages like this one to get you started on your search. Use this page and others like it to do some in-depth research on what changed between model years of a particular vehicle, you might be surprised what you find! We’re excited to be a part of your car buying experience and are looking forward to working with you!